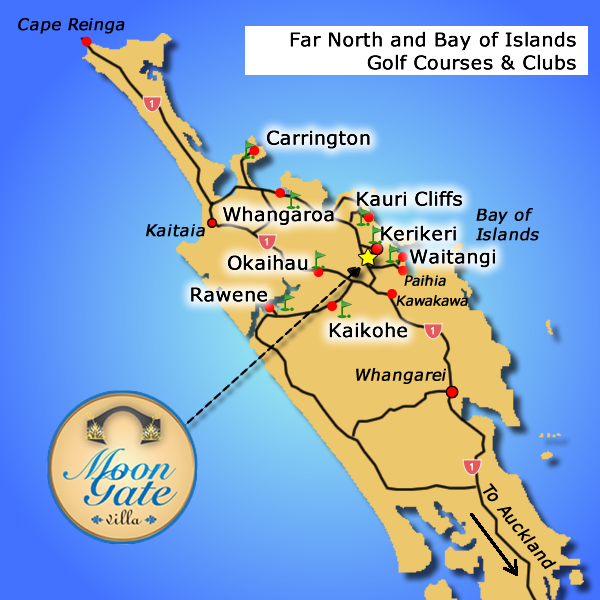 Golf at Moon Gate Villa - Kauri Cliffs, Carringtons and Bay of Islands. The Far North of New Zealand a perfect place for golf. A mild, sub-tropical climate means that you are likely to find the perfect conditions at almost any time throughout the year, and the generous rainfall (much of it at night) means that the fairways and flora are always green and lush. Moon Gate Villa is within 30 minutes drive of 5 courses, including proximity to some of the world’s best. The Bay of Islands Championship course is only 5 minutes, and the famous Kauri Cliffs 25 minutes drive. Bay of Islands (Kerikeri) 4 minutes Bay of Islands Championship course is noted for its variety of exotic and native trees, and surrounds of rolling hills and water. Many of our guests have found it unexpectedly challenging! Waitangi Golf Club 16 Minutes A great holiday course, with sea views and photo opportunities at every hole. Its 3+ star rating means it’s also very affordable. Golf at Kauri Cliffs 25 Minutes This 5 star course is considered one of New Zealand’s finest, and among the world’s best. Spectacular views over the Pacific Ocean and Cavalli Islands may prove to be a distraction. Our guests tell us it is more difficult than its sister course Cape Kidnappers. Kaikohe Golf & Squash Club 26 Minutes A good semi-private course located in central far north, close to Ngawha Springs hot pools, which may make for a relaxing bathe after the game! Whangaroa Golf Club 29 Minutes Past Kauri Cliffs, but before Carrington is this great course at an affordable price. Afterwards you’ll have spare change for lunch or dinner at the ‘World Famous’ Mangonui Fish Shop. Carrington Estate 1hr 20 minutes Our second 5 star course and also with magnificent ocean views. The 3000+ acre property has its own vineyards and winery, and is located on the Karikari Peninsula, with its pristine white sand beaches. For those that may find 9 holes sufficient, the following courses will allow time to explore their location afterwards. Okaihau Golf Club 10 Minutes Only minutes from Kerikeri and right next to the Puketi Forests, 9 holes means you’ll still have energy to complete one of the famous forest walks. Rawene Golf Club 55 Minutes Located on the Hokianga harbour/river, tiny Rawene is steeped in both pre European Maori history and early New Zealand history. After your 9 holes, stroll the quaint streets and find a quiet place for a spot of lunch overlooking the water. There are many options for those considering a golfing holiday in the Bay of Islands and Far North New Zealand. Plan to alternate a day’s play with another activity. Simply relax, or visit one of the famous cultural site such as Waitangi, take a sail among the islands, or perhaps relax and explore our local wineries for the day. Car hire is the most practical option, however there are private car services that can be arranged if necessary. Tours via plane and helicopter services are available to some of the more remote locations. International guests should consider booking a connecting flight from Auckland to Bay of Islands airport, which is less than 5 minutes from Moon Gate. Complimentary transfers are available. Please don’t hesitate to contact us if we can assist plan your trip.